Title: UP 4577 refueled in Tilford yd. Title: UP 4577 in Tilford yd. Description: This southbound was mostly autoracks, but, had some lumber on the point. 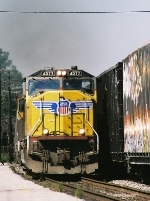 Description: NS mix Fright Train M30 passing through NS's Norris Yard in Irondale, AL. Description: UP 5036, UP 8123, UP 4577 and UP 8399 on point with UP 8254 ( SD9043MAC) pushing. Title: Wasn't expecting it on the eastbound. Description: Union Pacific SD70M #4577 trails on the Lathrop to Global 2, IL stack train (KLTG2-05) as it rolls through Colfax. Description: Union Pacific SD70ACe #8640 and SD70M #4577 lead the Lathrop to Global 2, IL stack train (KLTG2-05) through Colfax. Description: Catching me offguard, NS 820 brings a pair of UP locomotives east as it prepares to enter south yard. Description: UP 4928 leads a lengthy eastbound with a lot of power across the cornfields at Malta, IL.